My son loves books. Now, at almost 18 months, he will sit on the floor for 15 minutes or so reading to himself (and longer if someone reads to him! ), flipping through page after page and reciting words and lines he knows. It can be a challenge sometimes to get a new book through the pile of tried and true. However, when a book is in, it’s in. Over the past few months, I have been thinking about starting a feature of what the boy’s favorite books are each week or two weeks, however time allows, since they do change. These are the books that I can hardly get put away during the week, let alone during the day because he wants to read them over and over and over, often three times per sitting, and usually two to three sittings a day. And so they stay off the shelf until he has quenched his thirst and is ready to move on to the next love, visiting these established loves between times. 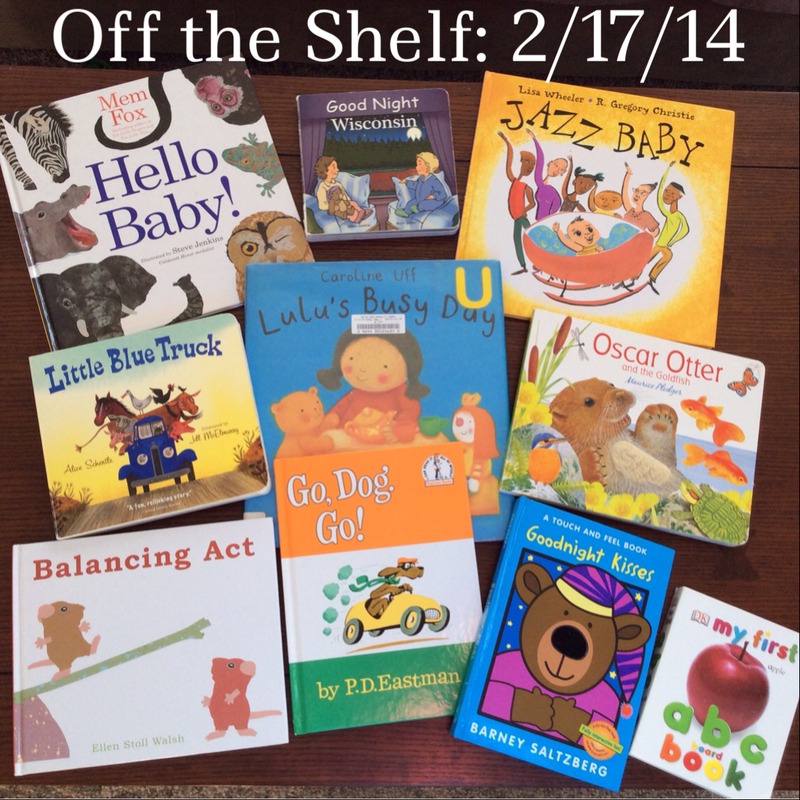 Without further ado, here is the first installment of Off the Shelf. My First ABC Book Board Book by DK Publishing, Inc.
Jazz Baby is still at the top of his list, and I will write a review later this week. This entry was posted in Books, Whimsies and tagged board books, books, favorites, off the shelf, picture books, reading, toddlers by PuddleReader. Bookmark the permalink. I still can’t put Goodnight Kisses away – although my youngest is 4 and the squeaker on the bug has been broken for about 2 years now. Love this idea, btw! I’m glad you like the idea– my reviews will never be able to cover everything we read, so I thought this would be a nice way to capture more of the books of the moment, as well as to document it for myself since these love affairs are rather fleeting but so intense while they are happening. My son calls Goodnight Kisses, “Me” since that’s the answer to every question in the story. 🙂 My only complaint is that our squeaker on the bug never worked!